Earlier this month we shared how ChipCAD used Lora RF click to measure the coverage of their LoraWAN network installed in Budapest. One of their customer now put the network to use, also with Lora RF click. It's a public Bike tracking system. Thanks to ChipCAD, Budapest has a LoRa gateway network covering almost the entire city, giving each of their customers a free 3 month trial. Developers are now tapping in, exploring the capabilities of this long range wireless protocol. 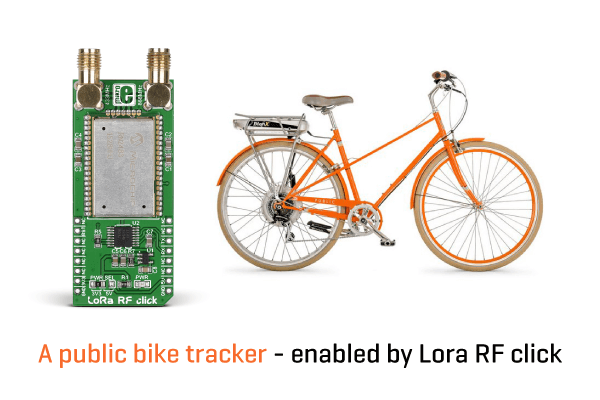 Mr. Péter Györke designed a low-power bike tracking system using GPS and LoRa. The GPS data could have been transmitted through the GSM network, but that solution has 10 times higher power consumption plus the user needs a SIM card. The unit on the bicycle uses a GPS receiver to periodically determine the position, then the radio module transmits to the gateway (multiple gateways can receive the transmission). The Internet gateways are connected to the network server, which forwards the packet to the application server, which is currently the exit of a WebSocket. Here Csala BikeTrk to the server on which the client processes (decodes) radio broadcasts and converts the format of the database schema. At the end of the process, the user can get a Web application using the data. The transmissions are fully encrypted, so privacy is ensured. This type of tracking system can be used for theft prevention, always an issue with bicycles. It's also a demonstration how click boards and accompanying software examples can prevent new technologies from stealing you more time than necessary – this whole project took only two days to implement. Be on the lookout – some great stretch goals for Hexiwear on Kickstarter coming up this week!